You are currently browsing the The Pet Product Guru blog archives for July, 2017. A perfect day for oldies –It’s a beautiful day on Delmarva and Edgewater Gold Radio is cranking out the best oldies of your life! 50s 60s 70s 80s plus the greatest pop standards! Listen all the time from our website The Edgewater Internet Radio Network! Yesterday, I took Molly for a checkup following an elevation of her phosphorus levels and dehydration. Molly improved throughout the week after taking medication called Epakitin and another renal medication to ease the burden on her kidneys. Epakitn is a phosphorus binder which keeps it from entering the blood, causing listlessness, vomiting and dehydration. When Molly went in for emergency treatment last week, she was poked and prodded with needles, hands and other equipment. Believe me, she didn’t like it at all. She had a followup appointment yesterday just to check her overall condition, specifically hydration. Dehydration occurs very quickly in cats with kidney disease. It is essential that cats with this condition stay week hydrated at all times. 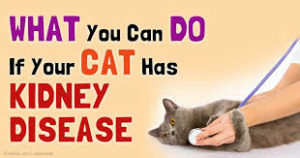 Kidney disease is a progressive, dangerous disease that takes the lives of many cats. I am determined to do everything I can to delay the progress of the disease and keep Molly with me for some time to come. Keep the oldies playing all weekend. Listen to the greatest variety of oldies from the 50’s through the 80’s plus great standards on Edgewater Gold Radio! Listen from our website: The Edgewater Internet Radio Network! I’m sure that there are many family barbeque’s going on this summer. 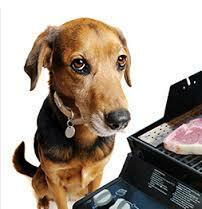 Many owners allow their dogs to roam free while they are cooking on the grill. The barbeque can be hazardous to your dog. Grills get very hot and your dog doesn’t realize that it’s hot and before you know it, he can really burn himself if he goes for that burger or hot dog. If your dog is a lively one, he may accidentally bump into the grill and knock it over and cause himself injury as well as others. Always keep your dog away from the grill. Keep him on his dog leash while you’re grilling. All hit music for the baby boomer generation. How about the 50s 60s 70s 80s plus traditional pop standards and vocals like Sinatra, Dean Martin, Ella Fitzgerald? A complete variety of oldies for your workday —Edgewater Gold Radio! Listen on our website: The Edgewater Internet Radio Network! Kidney disease in cats is very complicated. It’s very difficult to balance all of the components that compromise the kidneys to sustain life and maintain quality. One component is Phosphorus. High phosphorus levels can make the disease progress more quickly. Boyd LM, Langston C, Thompson K, Zivin K & Imanishi M Journal of Veterinary Internal Medicine 22(5) pp1111-7, found that there was an 11.8% increase in the risk of death for every one mg/dl increase in phosphorus in the cat’s blood. It is vital that phosphorus levels are kept low in cats with kidney disease. The reason why my cat Molly, got so sick and dehydrated last week was because her phosphorus levels jumped up. Most cat foods don’t give the phosphorus level in the active ingredients. Phosphorus should be no more that 0.5% in cats with kidney disease. If your cat has kidney disease and won’t eat a prescription diet that has lower protein and phosphorus levels, you must do some research and select foods that are low in phosphorus. I use Weruva with along with a phosphorus binder which removes phosphorus from the blood. I was including some other high quality food but they didn’t indicate the phosphorus levels. This may have cause Molly’s phosphorus levels to jump. She is now doing much better after this adjustment in her diet. Renal failure is a catch 22, your have to be very careful to monitor your cat, check his blood regularly and feed him a high quality ,low phosphorus, low protein diet. 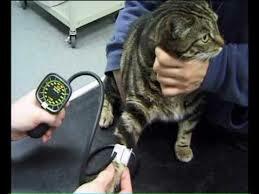 Just like humans, cats suffer from high blood pressure that can be caused by a variety of underlying conditions such and kidney and thyroid disease. Hypertension can cause the same problems as it does in humans. PetMD has published a feline blood pressure chart, they also describe how blood pressure is taken in cats. 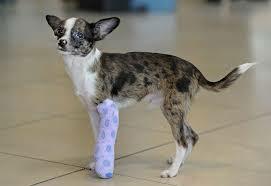 Blood pressure is often measured in pets in the same manner as in humans. An inflatable cuff will be placed on the cat’s paw or tail, and standard blood pressure measuring instruments will check the pressure. It is important to keep the cat still long enough to get an accurate reading. 180/120 — immediate treatment should be sought to limit the degree of other more severe complications. Thanks to PetMD for providing this valuable information. Golden oldies and a variety that you don’t find everywhere –EDGEWATER GOLD RADIO- The best mix go oldies. You can also find us on our website. THE EDGEWATER INTERNET RADIO NETWORK! Many dog owners spend a great deal of time selecting the ideal dog food. They want something that the dog will enjoy, but they also want to make sure that food is nutritious and healthy to continually put in their bodies. 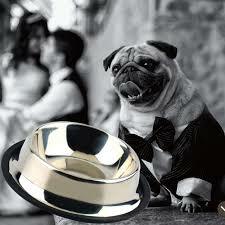 But not as many pet owners think about the dishes in which we serve this food. This can prove a mistake. 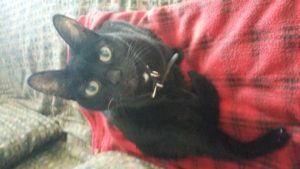 Yesterday was a tough day for myself and my 18 year old cat Molly. As you know she is suffering from Kidney disease and she also has a thyroid condition. She began vomiting, stopped eating and became very listless. When her conditioned worsened in the evening, I took her to the emergency 24 hour animal hospital near us. She was severely dehydrated as I suspected .With kidney disease, dehydration can occur very quickly. Various blood tests were run and it was determined that her kidney disease has advanced a little. There were also some other readings that were a bit troubling but right now, we’re focusing on her kidney disease. Her phosphorus level jumped up significantly causing the nausea and vomiting. She was hydrated and stabilized at the hospital. I was able to take her home. There are two new medications that I have to administer to her. One is a powder mixed with her food to make the phosphorus more tolerable to the kidneys and hopefully will reduce her nausea and vomiting. The other is Potassium Gluconate also helping kidney function. She is a bit better, this morning she drank ,ate a little bit and stopped vomiting. I’m watching her closely and I’m thankful that I have the opportunity to spent more time with her. I’ll be taking her back to the vet in a week. They’ll check her hydration and overall condition. I’m thankful to have her with me this long. Over the years, we’ve developed a special bond. Our furry little friends give us so much unconditional love. It’s only natural to do everything we can to keep them with us as long as we can. Music makes you feel better – If you’re feeling a bit low or are worried about your pet, try great oldies from the 50s through the 80s plus great pop standards on Edgewater Gold Radio! You can also listen on our webiste. The Edgewater Internet Radio Network!! If your dog cough’s, don’t take it lightly. There are certain types of coughs that may be serious. 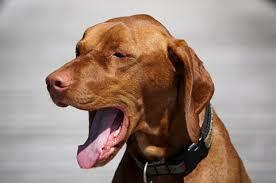 Here’s a description of certain types of dog coughs and what they may mean. A high, weak cough that sounds like gagging followed by swallowing and licking the lips could be tonsillitis and sore throat. A moist, bubbling cough indicates fluid or phlegm in the lungs could suggest pneumonia. A dry, hacking cough that is made worse after exercise or excitement could mean kennel cough. A spasm of prolonged coughing during the night or while lying down on the sternum could mean heart disease. This was the case with my dog who had heart failure. 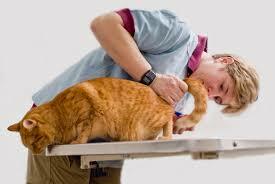 Any cough could be serious so have them checked by your vet as soon as you can. All hit radio – Music that you grew up with! Edgewater Gold Radio plays the largest variety of oldies from the 50s through the 80’s plus great standards! Listen all day, download our free app and you can also listen from our website: The Edgewater Internet Radio Network! I woke up this morning to a disturbance on my porch. Let me back track a bit. I have several bird houses hanging on my porch. Small birds have been making the nest their home this summer. They built a nest and had a little family inside the bird house. These birds have since grown and left the nest but now there’s a new family in there. The eggs have hatched and the parent birds have been constantly bringing food into the bird house to feed the little ones. I hear the babies crying for their food when I walk past the bird house. This morning, I heard lots of birds chirping on the front porch. I looked and saw the parent birds trying to bring food to the babies but when they approached the bird house they quickly turned away! They kept trying and trying and chirping louder and louder as if very frustrated. I knew something was wrong so I slowly opened to door to the bird house and there was an 8 inch snake curled up on top of the nest! I quickly grabbed an old plastic salad spoon and scooped the snake out of the nest. The nest was deep and I couldn’t tell if the baby birds were harmed. I hope not. After awhile, I saw that the parent birds were once again taking food inside the nest to feed the little ones. 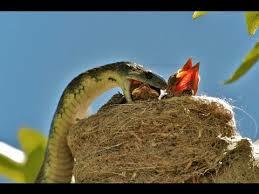 Sure hope that they’re ok. Hope that nasty snake doesn’t find his way back to the nest. A little drama for a Wednesday morning. We must always be aware of predators when it comes to our pets! Great oldies play all the time on our live/local internet station from Rehoboth Beach, De. Edgewater Gold Radio! The best variety from the 50s 60s 70s 80s and pop standards! Listen from our website, check out the article written about us in the Cape Gazette and read the local buzz from the Delaware beaches! Edgewater Internet Radio Network! 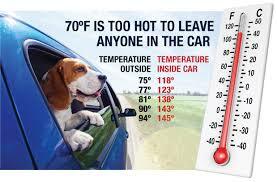 It’s a fact, dogs can suffer heat stroke just as human’s can. We’ve gone over ways to keep your best friend cool during Summer but what are the signs that your dog may be suffering from heat stroke. Here’s what to look for. Very young and very old dogs have a higher risk of developing heat stroke than do dogs in the prime of their lives. Brachycephalic breeds, obese animals, long-haired dogs and dogs that are black or dark in color are also predisposed to developing heat stroke. Dogs with hyperthyroidism, heart disease, lung disease or thick hair coats have an increased risk as well. Owners who notice that their dog is restless, uneasy, having breathing problems or otherwise is just not doing right should take it to a veterinary clinic immediately. Thanks to Petwave.com for providing some of this valuable information. Keep your pets cool and the oldies playing during these hot summer months with Edgewater GOLD Radio – music variety from four decades 50s 60s 70s 80s and legendary vocals and standards. Listen from our website: The Edgewater Internet Radio Network!